When I was in the fifth class of high school, the school arranged a week stay in London for all students, Well, actually my class went to Rome, but some of my best friends from another class went to London, and I was allowed to go with that class. This was in the mid-seventies and while our parents were told that it was an educational trip, I didn’t see a teacher all week. But I did see Queen play at their open air concert in Hide Park and I visited a lot of record shops. Our hotel was in Brixton, but I had no idea of the situation there, that became pretty explosive only half a year later. 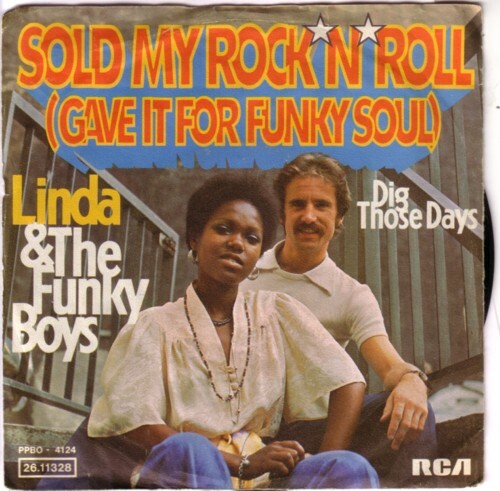 Among the records that I bought back then and still have (I have not kept all of them; I remember a pile of reggae LP’s that I gave away when I thought I had heard enough reggae for the rest of my life…) is a 45 by Linda & the Funky Boys. Of all the records that I bought in London that week, this record is the one that reminds me most of all of that week. Of course I bough every record of Linda & the Funky Boys that I came across later. I have five 45’s, but two are the same song with a different B-side. It are definitely not the best records from my collection, but they do make me happy when they fall from the shelf.